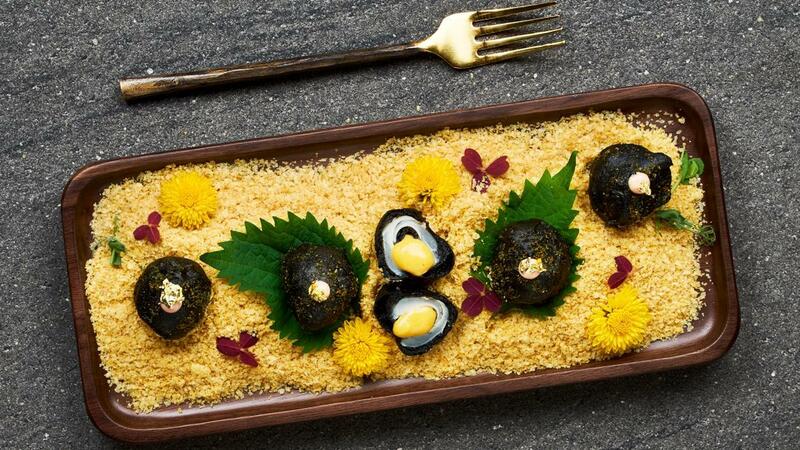 Fresh lychees coated with a squid-ink batter, stuffed with prawn and piped in creamy salted egg, then deep-fried to a golden crisp - these gems may seem a surprising combination of ingredients, but once savoured, you won’t doubt them a second more. In a mixing bowl, mix all the ingredients together and transfer it into an espuma bottle. Charge with two Co2 charger. In a pot, melt margarine. Add in evaporated milk and bring to boil. Whisk in Knorr golden salted egg powder and seasoning. Remove from heat fold in mayo. Preheat deep fryer to 180 degree. Pipe salted egg mayo into lychee and stuff a prawn bit to prevent it from flowing out. Coat lychee with corn flour and coat it with the batter. Deep fry lychee till crispy.